Another name for Elmer was Elmer ELDREDGE. � Residence, 6 Dec 1936, Davenport, Lincoln County, Oklahoma, United States. He married Vergie Hamilton in Lincoln County, Oklahoma and was listed "of Davenport, Oklahoma" on the marriage Certificate. � Military: Inducted Into The Navy, 15 Mar 1945. � Military: Discharge, 31 Jan 1946. I, Elmer Eldridge of Lincoln County, State of Oklahoma, aged 23 years, do solemnly swear that I am acquainted with the parties named in the following schedule and the facts therein set forth. And that the said parties or either of them are not disqualified or incapable under the law of entering into the marriage relation, nor are they of relationship prohibited by law, and that neither of said parties have ever been afflicted with venereal disease. Subscribed and sworn to before me, this 4th day of December 1936. GLENN PARROTT, Deputy Court Clerk. Being satisfied of the truth and sufficiency, and that there are no legal impediments to such marriage the application is hereby granted. Filed the 4th day of December 1936. You are hereby authorized to join in marriage Elmer Eldridge of Davenport, Okla, aged 23 years, and Virgie Hamilton of Denver, Colo., aged 20 years, and of this license you will make due return to my office within thirty days from this date. WITNESS my hand and official seal, this 4th day of December A.D. 1936. My credentials filed in Lincoln County, Oklahoma, recorded in Book _____, Page _____. Filed the 8th day of December 1936. 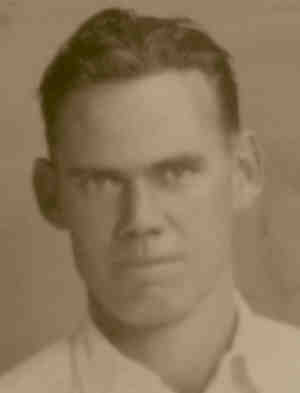 3 Compiled service record, Elmer Eldridge, Seaman, First Class, 147th and 125th Naval Construction Battalion; World War II; National Personnel Records Center, St. Louis. 5 Arkansas Department of Health, Bureau of Vital Statistics, Death Certificate, 92-008687. 6 Ancestry.com, Social Security Death Index (Provo, UT, USA: MyFamily.com, Inc., 2006). Otis Eldrige is 37 and is married to Emma, age 34. They have nine children living with them: Chester, age 13, Esther, age 11, Desta, age 8, Elmer, age 6, Estell, age 4, Evertt, age 2, and Vester, age 3/12. He, Emma and the children were all born in Arkansas. His father, Levi, age 75, was born in Illinois and mother, Effie, age 63, was born in Missouri. Both are living with Otis and Emma. He was a farmer and could read and write. He is 47 and married to Emma, age 45, at age 22. They have ten children living with them: Elmer, age 16, Estell, age 15, Evert, age 12, Vester, age 10, Lester, age 8, Vessie, age 7, Essie, age 5 11/12, Marie, age 4 5/12, Lorene, age 2 6/12, and Maxine, age 10/12. Elmer, Estell and Evert are all listed as "Laborers" even at such young ages. None of the younger kids (after Evert) are listed as able to read and write or have gone to school. He, Emma and the children were all born in Arkansas. His father was born in Illinois and mother in Missouri. He was a farmer and could read and write. 9 Dec 1970, Obituary of Vergie Hamilton Eldridge. Mrs. Virgie Hamilton Eldridge, 54, died last Friday morning, December 18, at her home in McGehee. She had been a resident fo McGehee for the past nineteen years and was a member of the First Baptist Church. She is survived by her husband, Elmer Eldridge; a son Elmer Eldridge, Jr. of Little Rock; a daughter, Mrs. Nellie Ruth Dipert of Arlington, Texas; her mother, Mrs. Ruth Hamilton of McGehee; four brothers, Elmer Hamilton of McGehee; Ervin Hamilton of Quincy, Ohio, Everett Hamilton and Harold Hamilton, both of Fort Worth, Texas; three sisters, Mrs. Dorothy Chidester of Dumas, Mrs. Marvie Whatley of McGehee and Mrs. Ruby Beavers of Spring Hill, La., and three grandchildren. The funeral was held Sunday afternoon at the First Baptist Church with the pastor, the Rev. Mason Craig, officiating. Burial was in the McGehee Cemetery by Dyer Funeral Home. ORANGE COVE-Funeral services for E. E. "Blackie" Eldridge, 44, who was killed by a train, will be held tomorrow at 2 p.m. in Cairns Reedley Chapel. Burial will be in Smith Mountain Cemetery. Eldridge, a native of Arkansas, live here for the last 22 years. His last place of residence was 902 12th St. He was a construction worker. Surviving are six brothers, Otis Eldridge of San Jose, Elmer Eldridge of Arkansas, Everett Eldridge of Sacramento, Lester Eldridge of Oklahoma, Vester Eldridge of Santa Maria and Vessie Eldridge of Boise, Idaho; four sisters, Mrs. Esther Ward of Dinuba, Mrs. Lorene Taylor of Sanger, Mrs. Martha Stewart of Orange Cove and Mrs. Maxine Holt of Fresno. 11 Delayed Birth Certificate, Arkansas #62-000+92. 10.In what State or Country was Father born?Ark. I hereby swear under oath in full knowledge of the penalties of the law for false statement tha, to my best knowledge and belief, the facts above stated are true and correct in every particular. I am related to this child as [blank] (Attending physician, midwife, parent, or person at least twelve years older having knowledge of birt) and my present age is 65 years. 22.a. On the basis of the examination of the body and/or the investigation, in my opinion, death occurred on the date and due to the cause(s) stated. 13 Dec 1970, Obituary of Vergie Hamilton Eldridge, McGehee Cemetary.